This post is the first in a series in which Frontier employees share their organic living “Aha!” moment – an experience that shaped their commitment to a more mindful lifestyle. 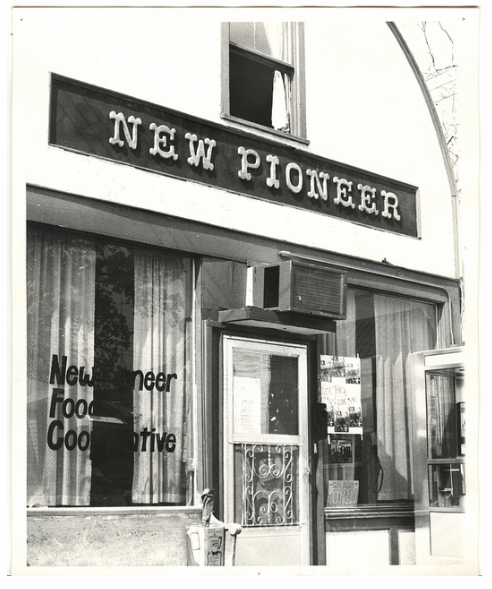 My life changed in 1971 when I walked into New Pioneer Co-op at 518 Bowery Street in Iowa City. New Pioneer Co-op opened in Iowa City in 1971. It was after walking through this door, at 518 Bowery St., that I first encountered organic living. Since Frontier was founded in 1976, we’ve been a co-op. But what exactly does that mean? Our co-op members are the owners of Frontier. 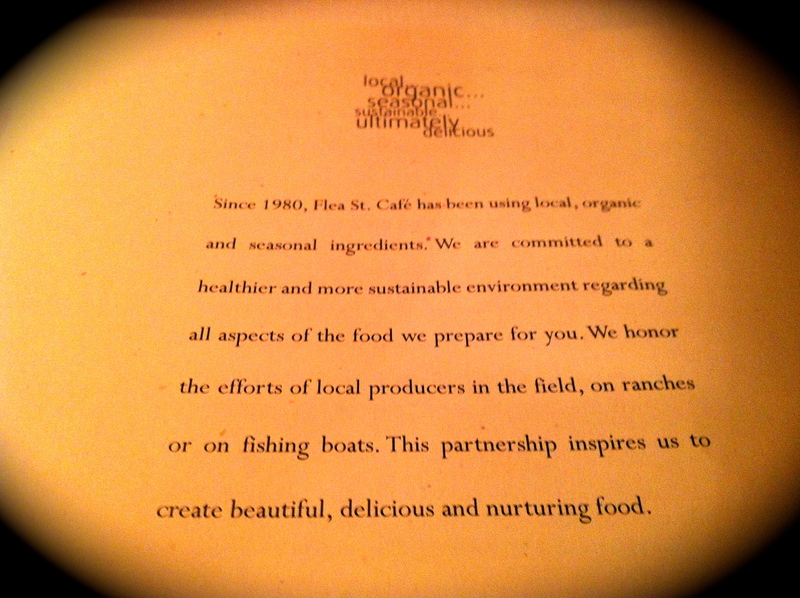 They guide our business decisions, share in our success, and support organic farmers around the world. Since the co-op began, we’ve remained firmly committed to our founding values — values like integrity, openness, social responsibility, and respect for the environment. We’ve always considered the way we do business an essential part of our success — and we consider it a requirement of our success that we grow and prosper by contributing to the world rather than exploiting it. We feel this special relationship of ownership is at the heart of our success. 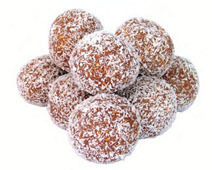 Not only do we have unique insight into natural products by having our member/owners in direct contact with the consumers of the products, the co-op structure has fostered our honest, responsible business practices that are increasingly valued in the marketplace. We apply this test to everything from our product ingredient decisions to the sharing of information with our customers. And we invite you to join us as a member of our co-op! 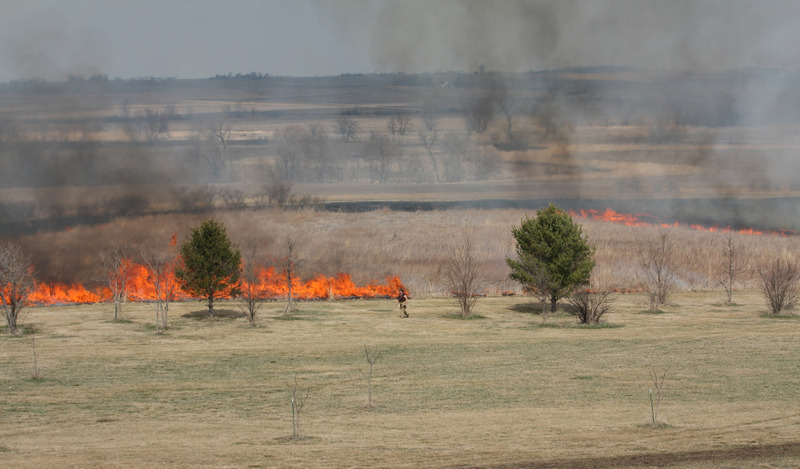 On March 16, I watched the eastern half of the Frontier prairie go up in flames. This part of the prairie hadn’t been burned for seven or eight years and the plant litter was thick, so the fire burned hot and fast. 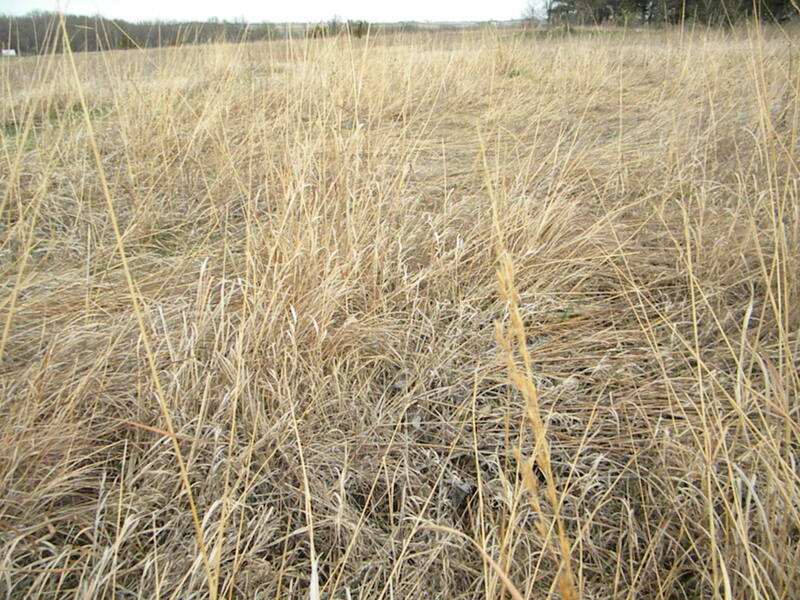 Fire has been important to maintaining the prairie that covers the Midwest since before the arrival of settlers. 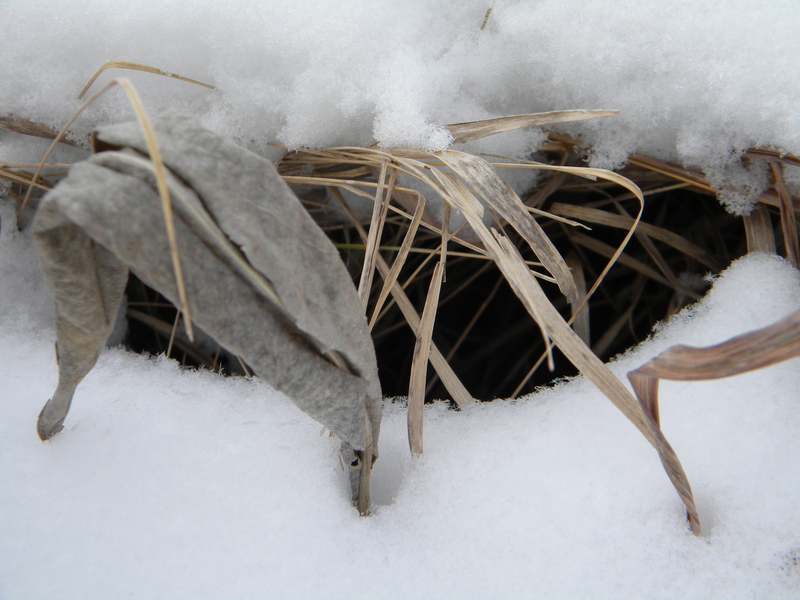 Native prairie grasses and flowering plants carry the buds for next year’s growth underground where they are protected from fire. 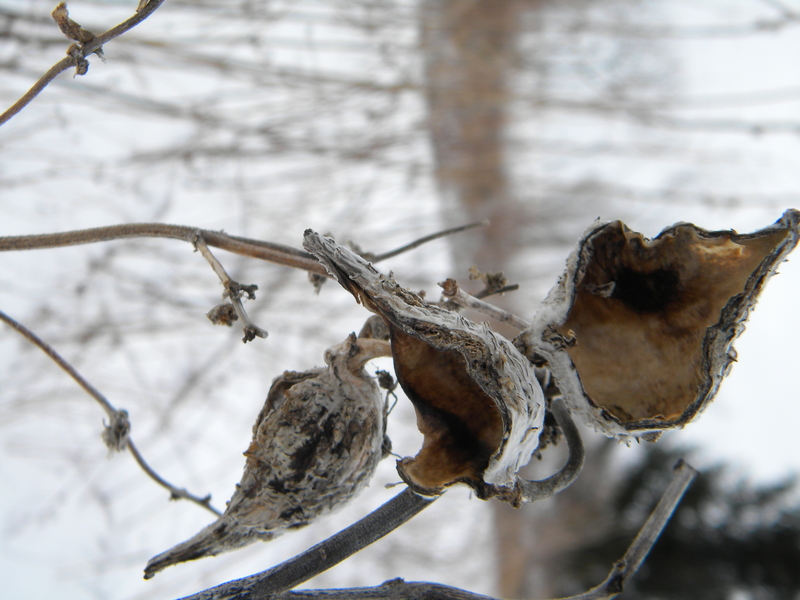 The buds of trees are above ground where they’re easily damaged or killed by fire. 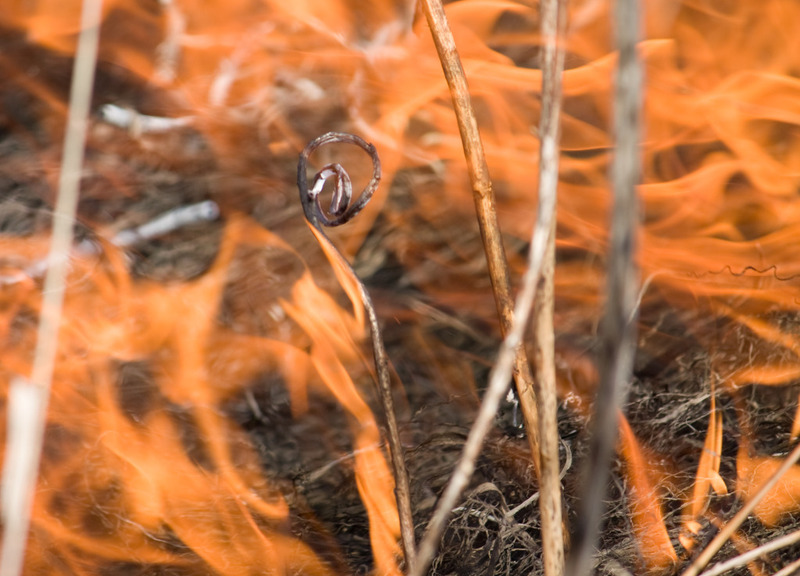 Young trees and seedlings are killed by fire. 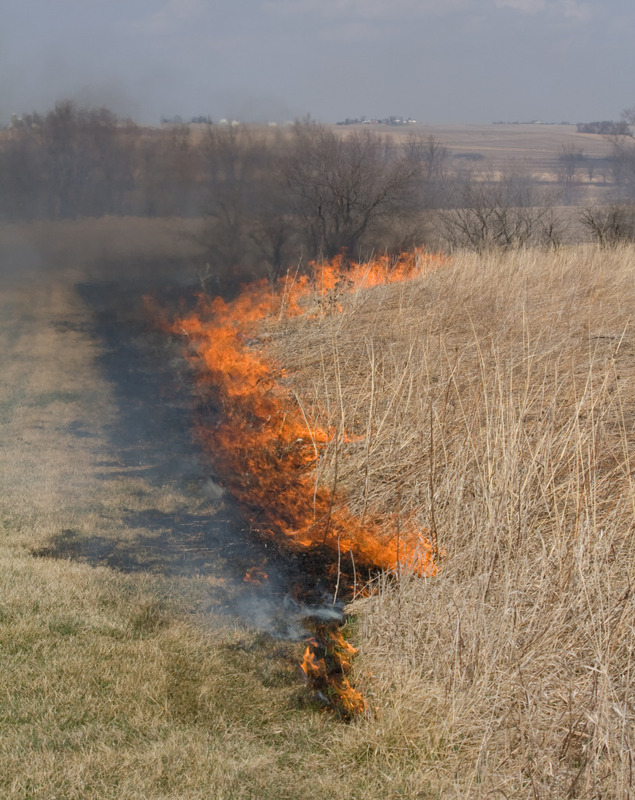 Fire also helps rid the prairie of the build-up of heavy plant litter which can smother or shade other plants. 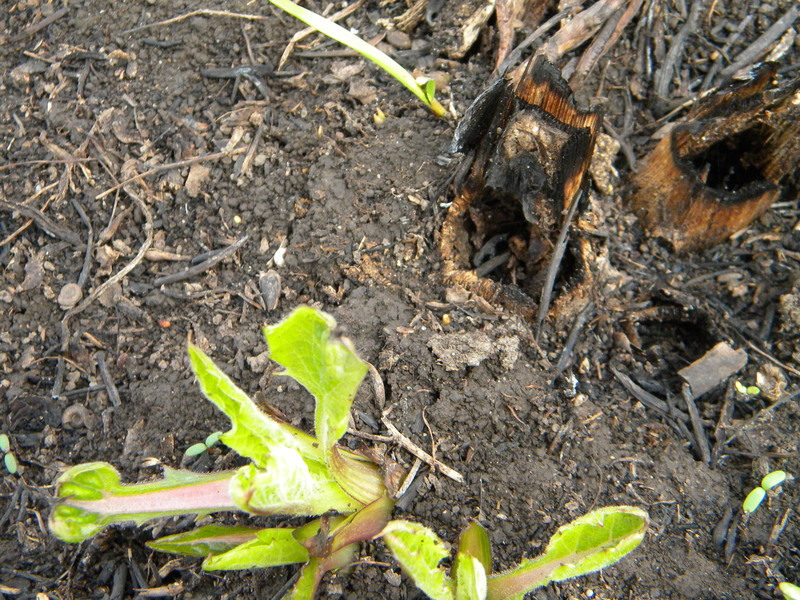 Burning opens up the land to sun and rains and returns nutrients back to the soil. 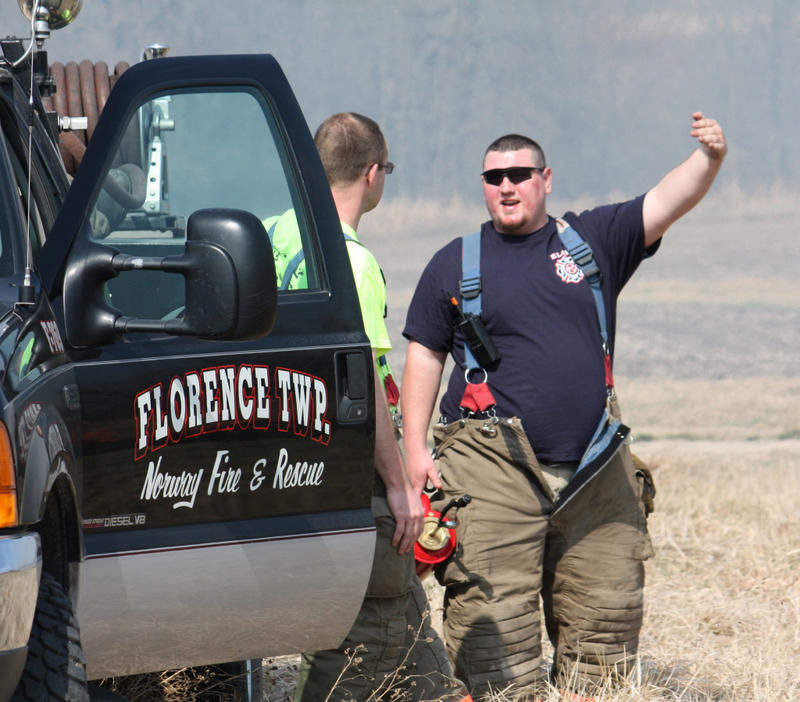 Our local fire department volunteers are our prairie burn heroes. 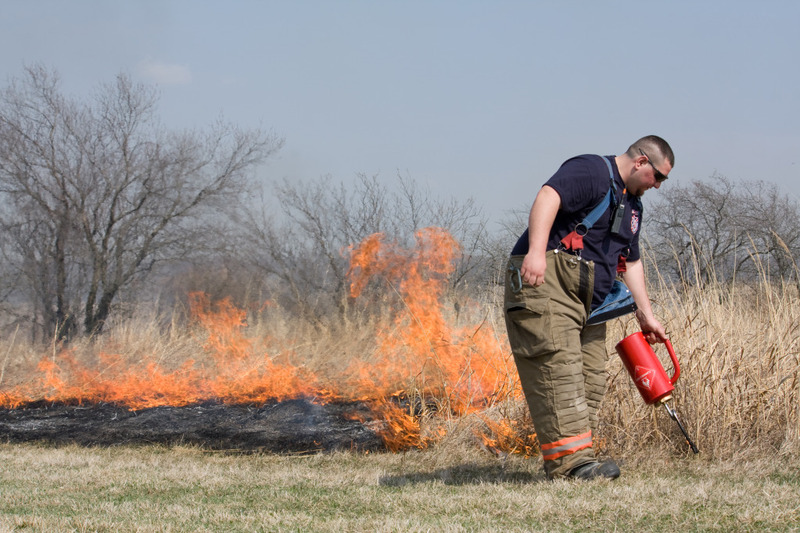 They take the opportunity to practice handling grass fires by conducting a controlled burn of our prairie. For us, it’s assurance that the fire won’t get out of control. The day was perfect for the burn: sunny, warm and breezy. While we didn’t want a strong wind, the 10-mph wind out of the south was perfect to help hurry the flames along. 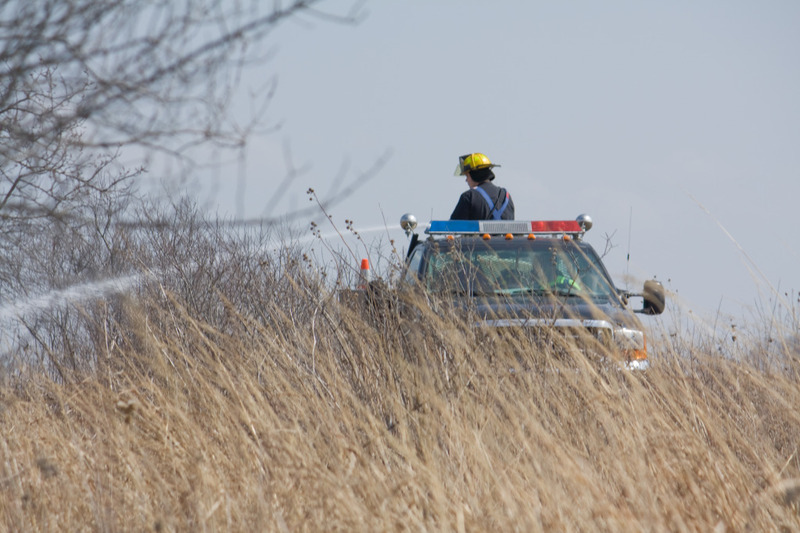 The burn began with a water truck driving around parts of the perimeter and wetting down trees and bushes that were close to the prairie. The firefighters then started a back fire on the north side of the prairie using a small drip torch. The back fire burned more slowly because it was burning into the wind. It created a burned area that would corral the main fire. The firefighters left an opening in the backburn to provide exits for wildlife. 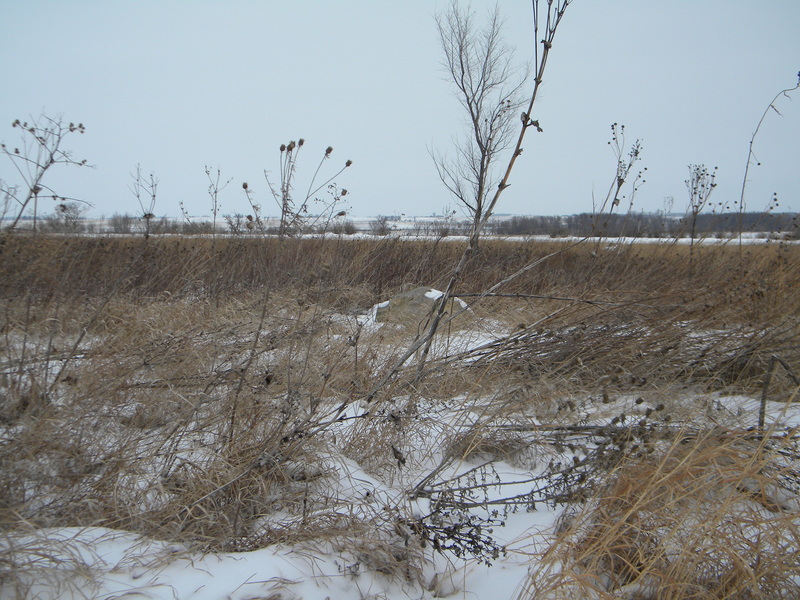 We saw pheasants, rabbits, snakes, mice and many red-winged blackbirds moving to the unburned section of prairie. 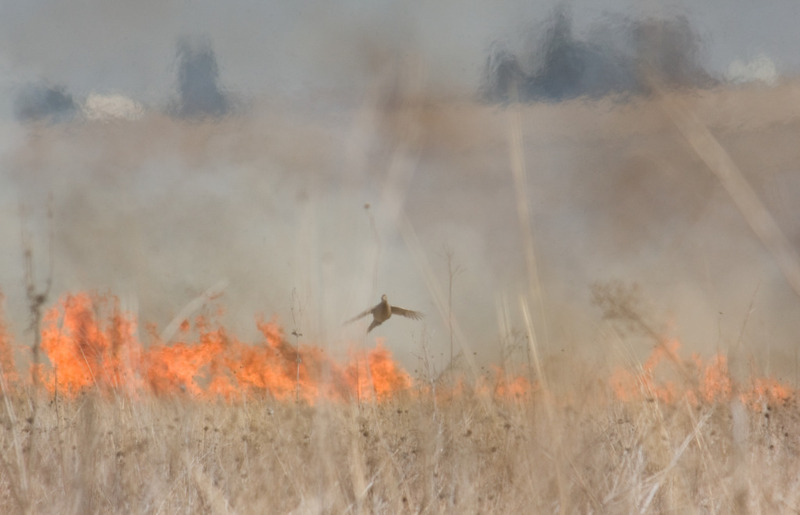 We always burn our prairie in alternate years to leave nesting sites for the prairie wildlife. 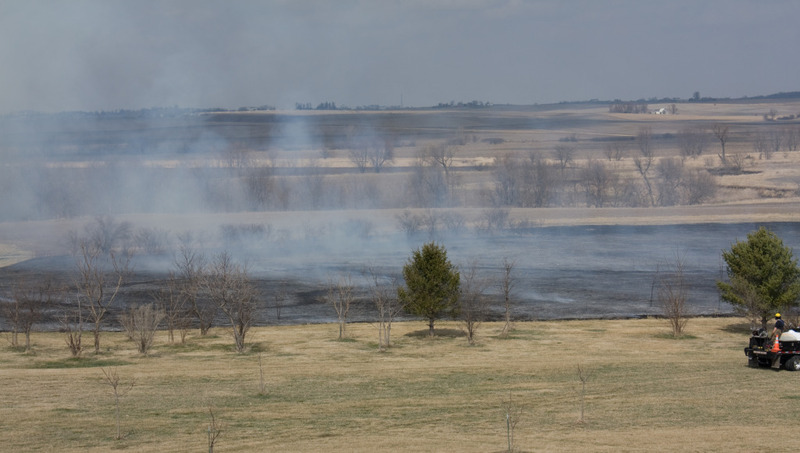 As the backburn started to die out, another was started on the lower east and west sides of the prairie. The east burn came up over a small hill, and catching the wind, began to turn hot and strong with flames shooting up into the air. 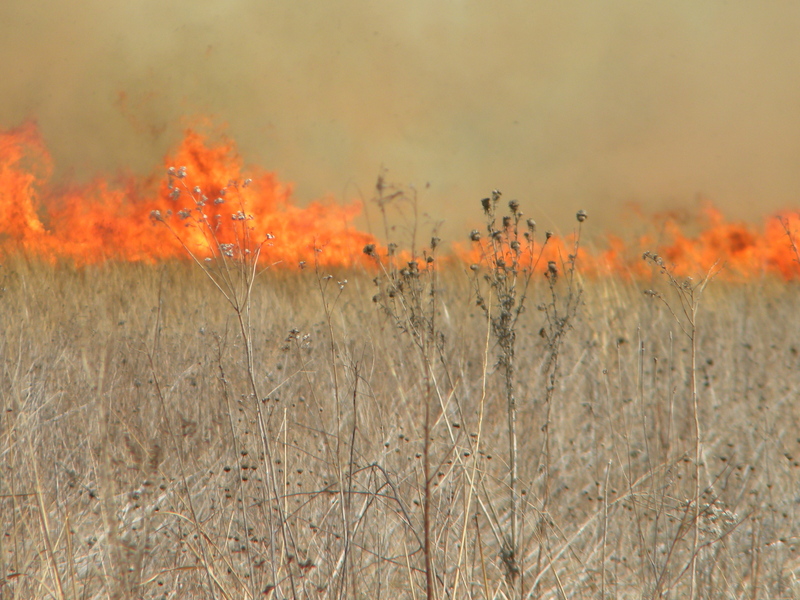 It was our first sight of the strength and ferocity of a prairie fire. The final phase of the burn came when the rest of the east side and the south sides were set on fire. 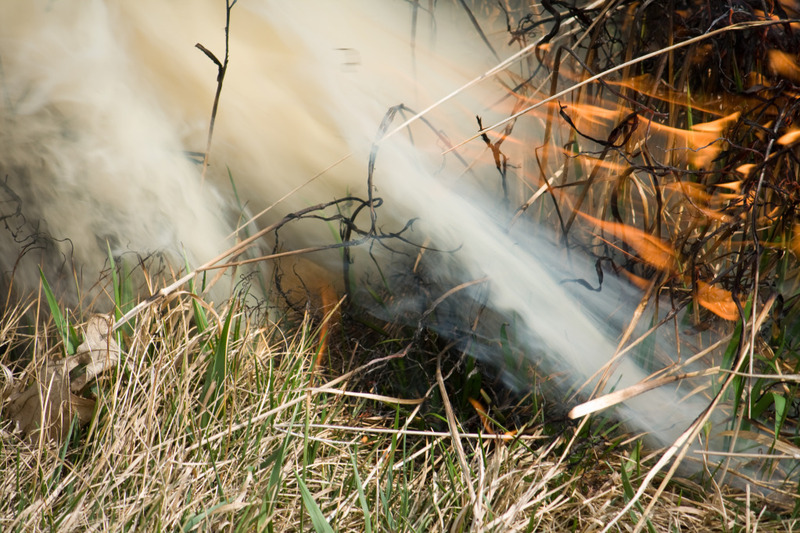 If all went well, the fire would burn the rest of the way across the prairie and end at the small pond. I walked to the pond to watch the approach of the fire. As it came over the ridge the sound was loud and a bit frightening. Flames were 20 feet high and the fire was advancing very fast. 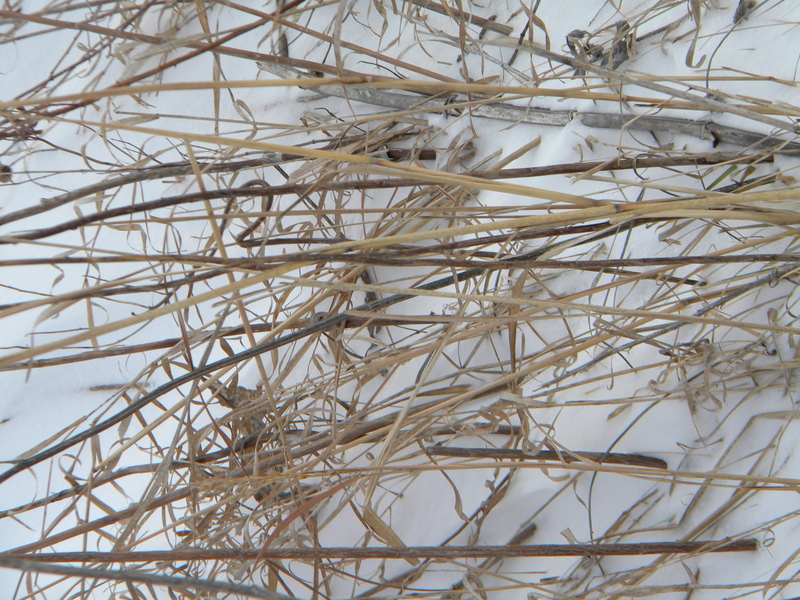 I looked up from my camera and it suddenly seemed that it would overwhelm me and my small pond area refuge. Not to worry, though. Minutes later it was all but over and lingering smoke and the ashes of the dead foliage puffed across the blackened prairie. 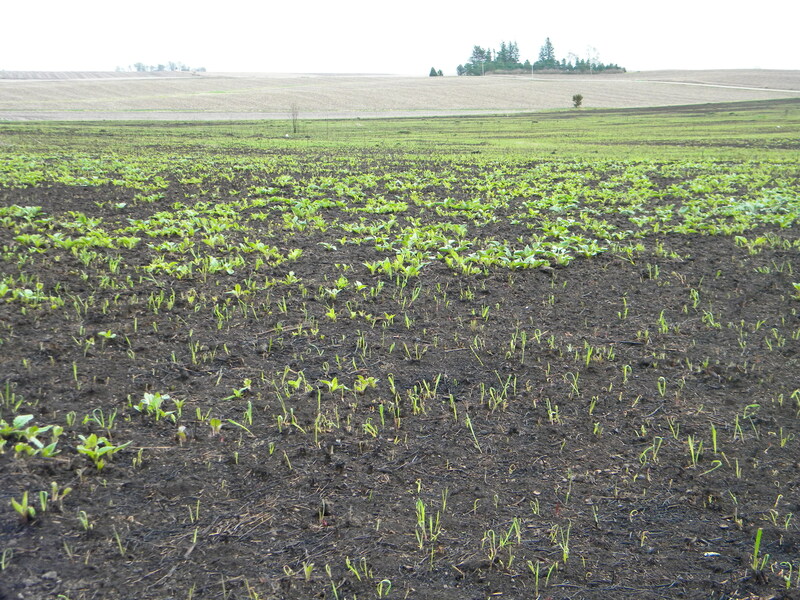 Five days after the burn, the blackened prairie is already turning green. 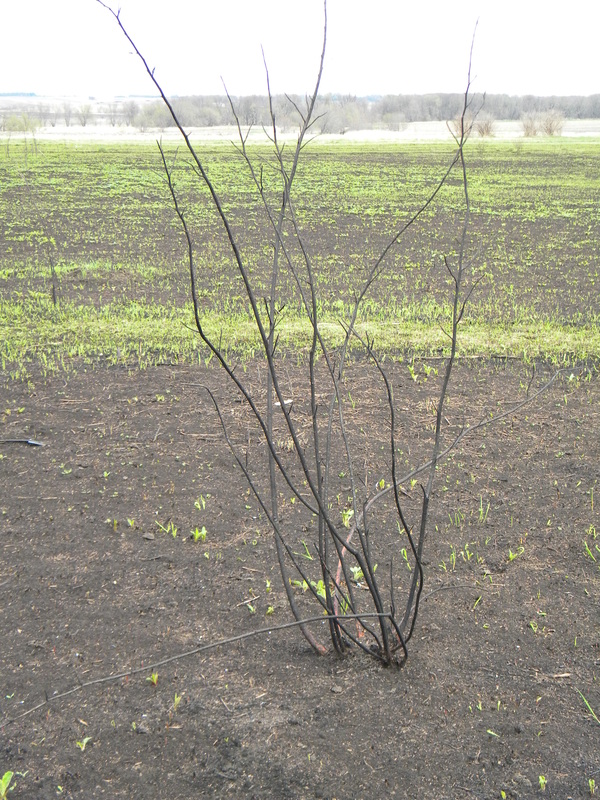 Helped along by rain and warm temperatures, the benefits of fire can quickly be seen as newly exposed soil hastens the emergence of plants. 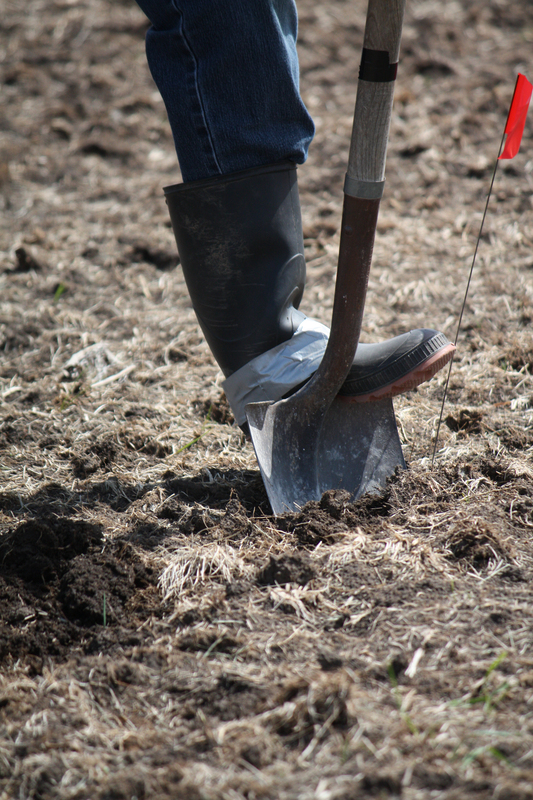 Next month we’ll look at what’s coming up — in both the burned and unburned portions of the prairie –and we’ll see how they compare. Iowa winter has been warmer and drier than normal. 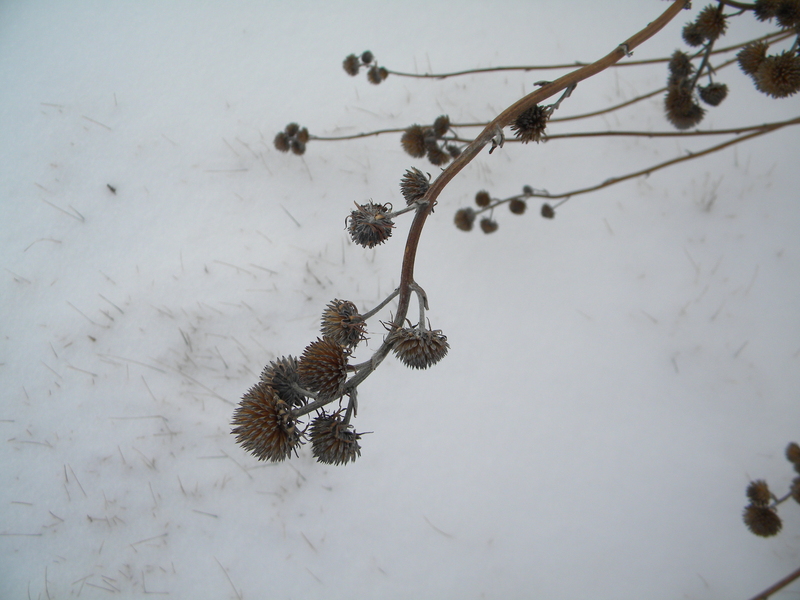 In fact, it wasn’t until nearly mid-January that we had our first real snowfall. 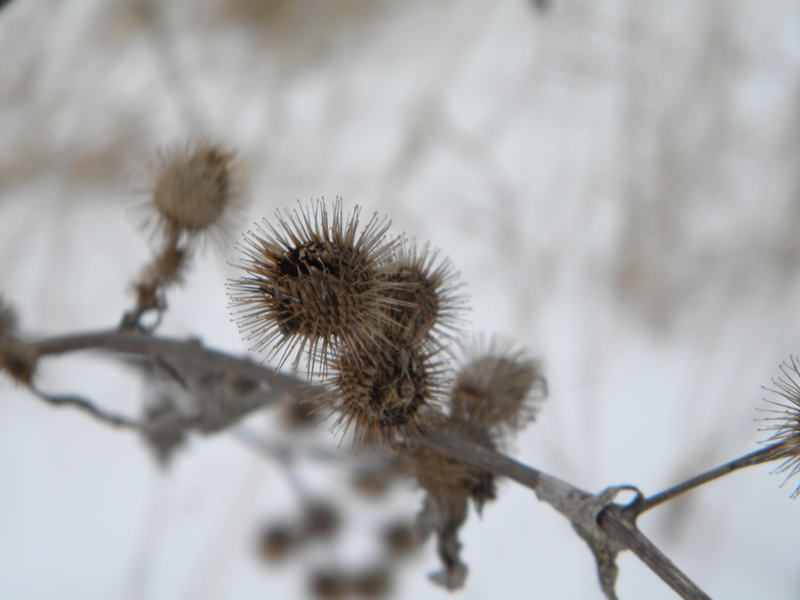 With a fluffy blanket of four inches of fresh snow covering the prairie, I grabbed tall boots and camera and headed out to take a look. 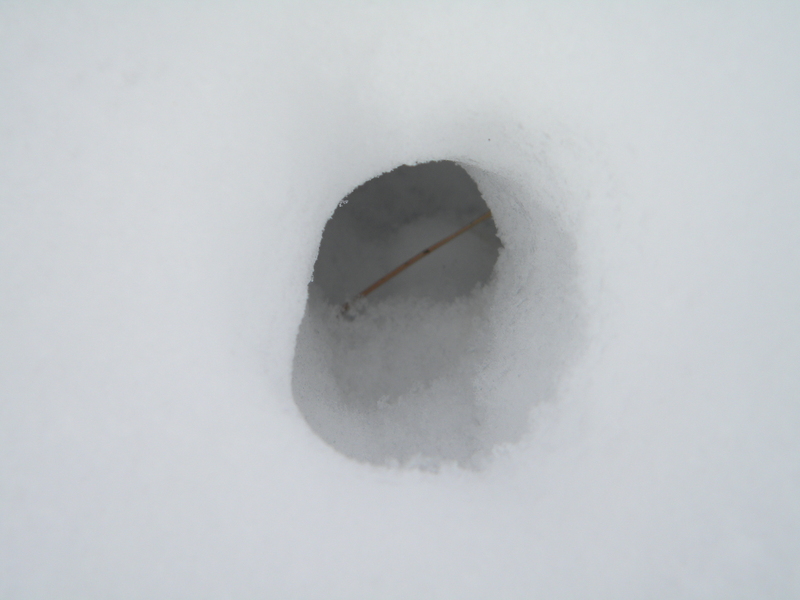 I expected to see a lot of tracks, but the winds were still blowing the light snow around, keeping the surface smooth except for a few small snow tunnels. 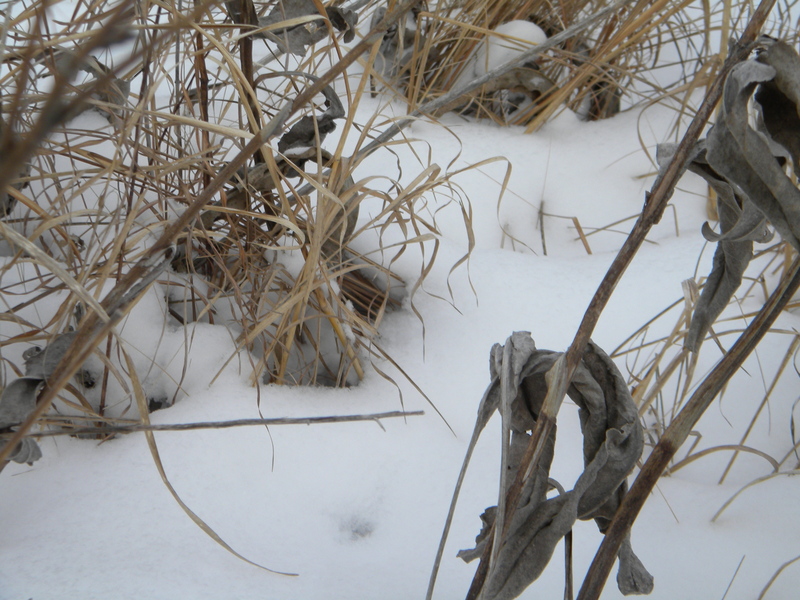 The tall grasses lean over, and, with the other prairie plants, form small caves that are havens for rabbits and rodents. 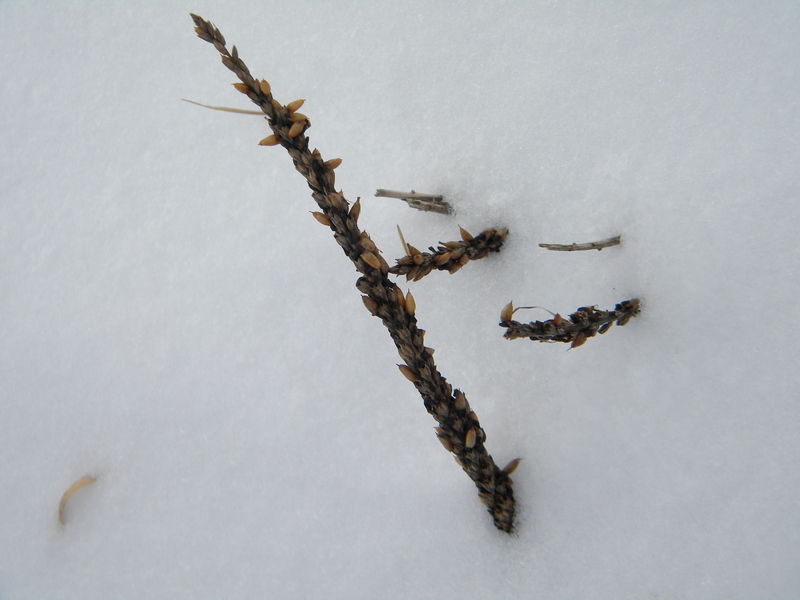 The abundance of seeds produced by the prairie’s grasses and forbs have mostly been harvested and stored as winter food. 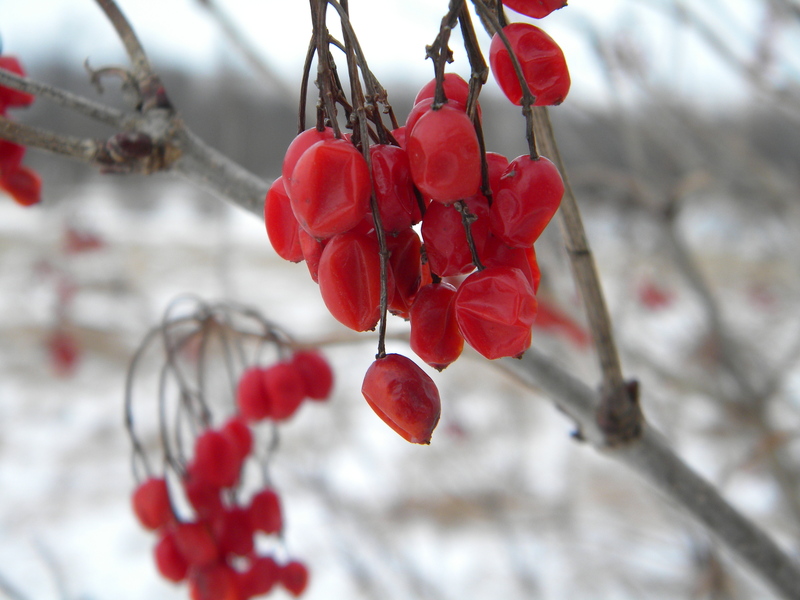 Viburnum berries still cling to the bushes edging part of the prairie. Other than the biting wind, all was still. 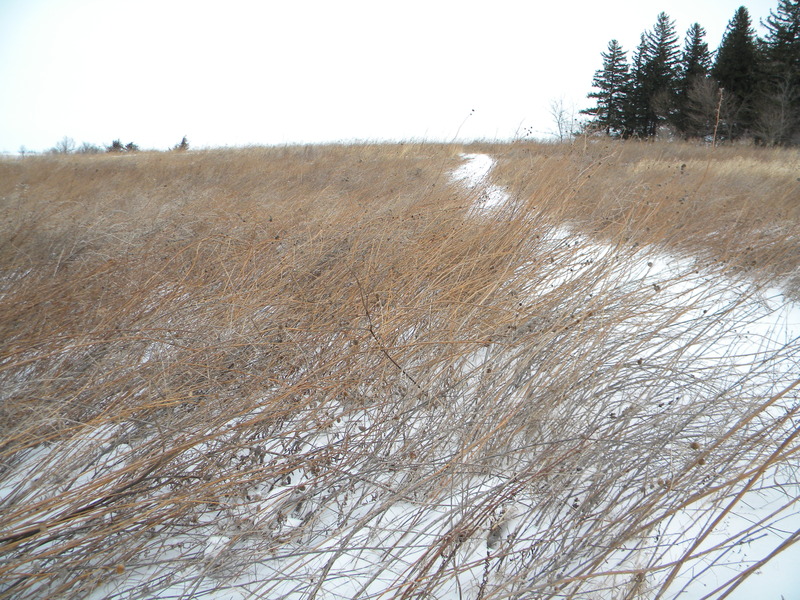 I could almost imagine myself wandering, lost on a winter prairie of the 1800s, when it was not uncommon for settlers to be caught in a snowstorm and not be able to make their way home. As I made my way along the path, I played a little game to see how many of the plants I could still identify. 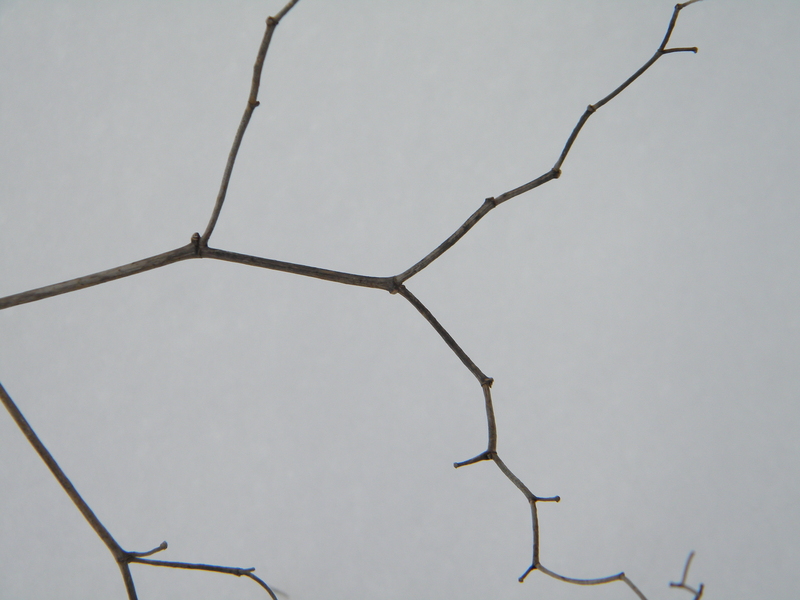 Their dark shapes against the snowy whiteness was striking. Some of our marketers had quite the adventure on their way to product development meetings in San Francisco last week. Follow along with them as they’re treated to some very special hospitality by one of the pioneering local/organic chefs in the Bay Area, restaurateur and cookbook author Jesse Ziff Cool. Jesse has traveled the world meeting farmers, chefs, shop keepers and families, seeking and enjoying local and sustainable foods and traditions along the way. We met Jesse at an Expo event, and have maintained a friendship and mutual admiration ever since. We’re also fans of her cookbook, Simply Organic. She invited our group of marketers — Kory, Brian, Clint and Brett, to visit her at her beautiful home and one of her restaurants while they were in the area. First stop was Jesse’s beautiful home. Kory and Brian posed for a photo in front of the house. Note the CoolEatz license plate – the name of Jesse’s restaurant and catering company. 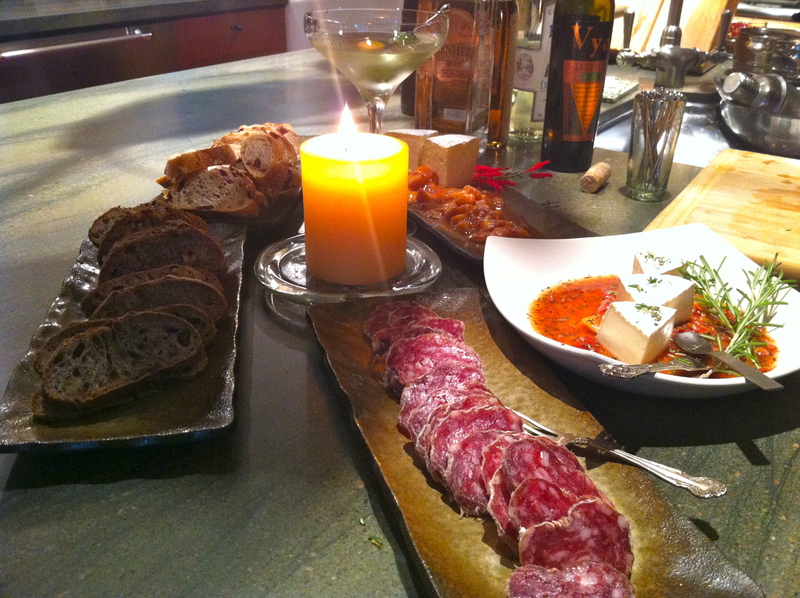 Inside, Jesse graciously treated the group to some delicious appetizers featuring our herbs and spices. Jesse has served a colorful array of guests in her home. 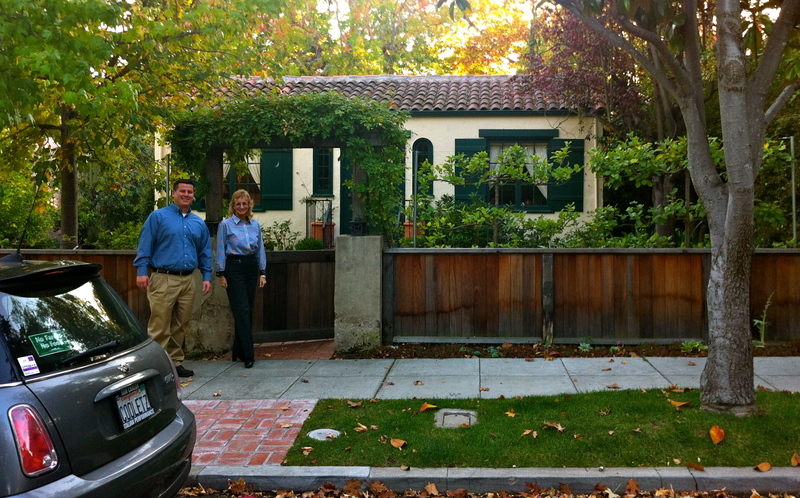 Her neighbors include some of the most famous names in Silicon Valley. 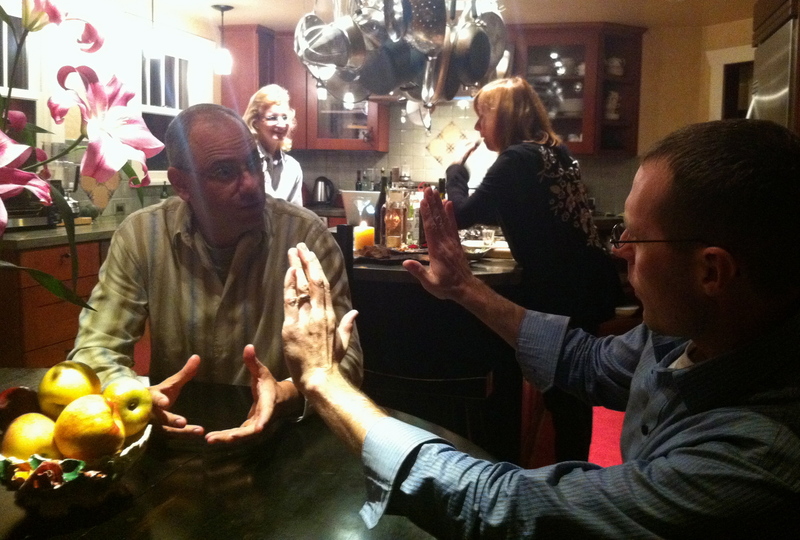 Here, Clint and Brett decide to reenact Steve Jobs and Bill Gates’ visit to Jesse’s house, since they were sitting at the same table. 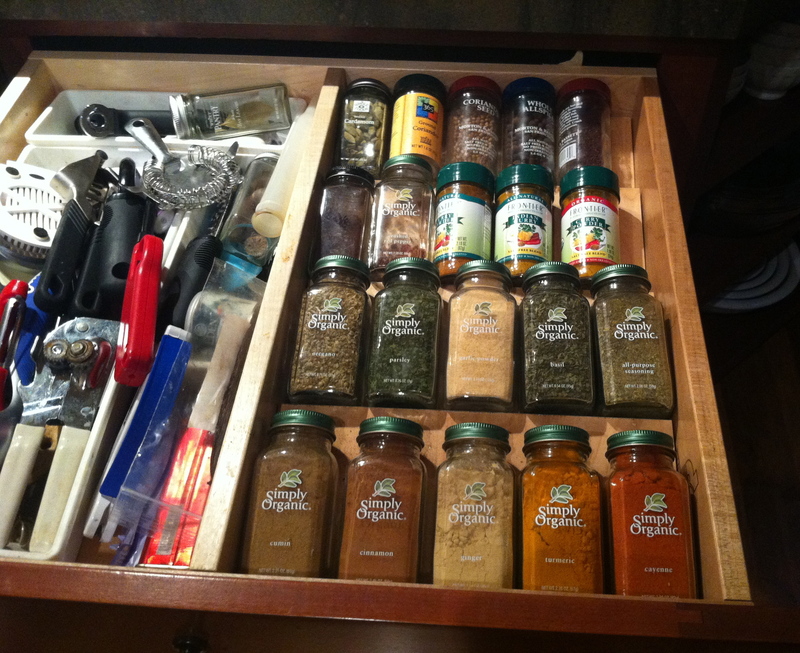 Jesse spontaneously showed off the contents of her spice drawer. Very impressive! 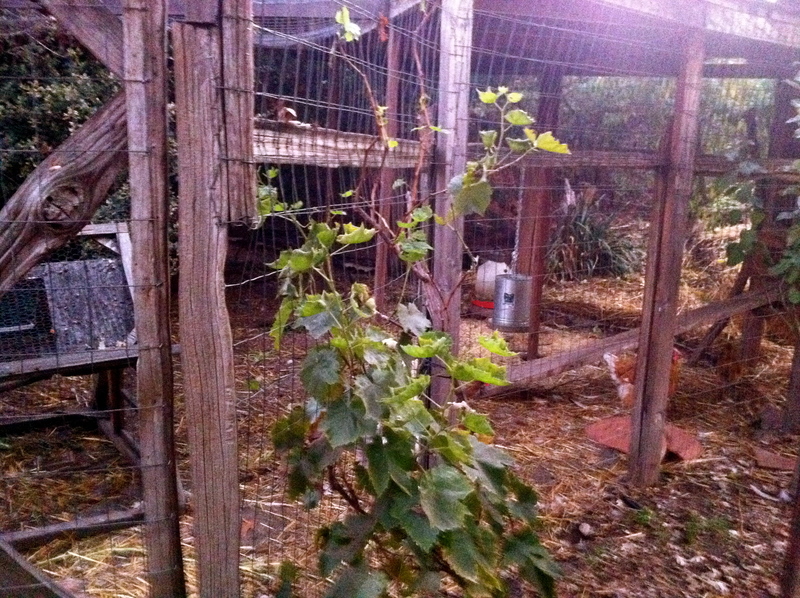 She then hosted a tour of the grounds, including her garden and chicken coop. 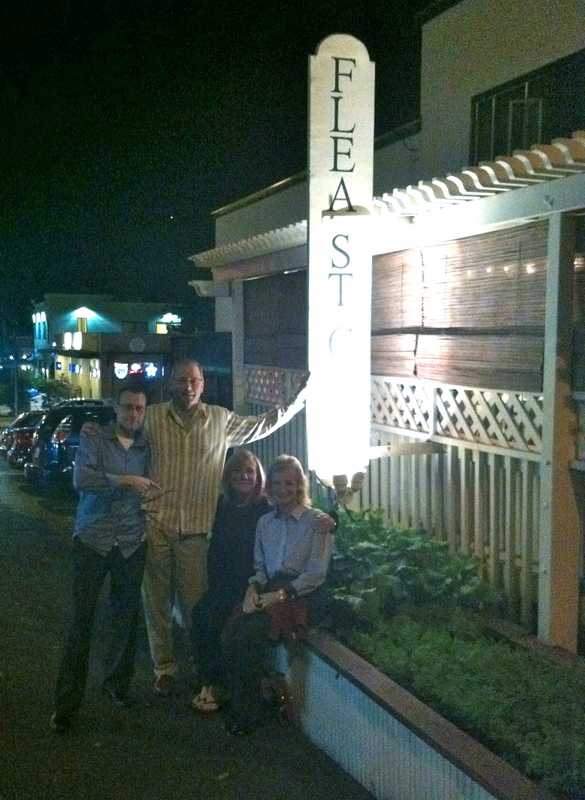 The group then moved on to one of Jesse’s restaurants, the Flea Street Café in Menlo Park. From left, Brett, Clint, Jesse and Kory. 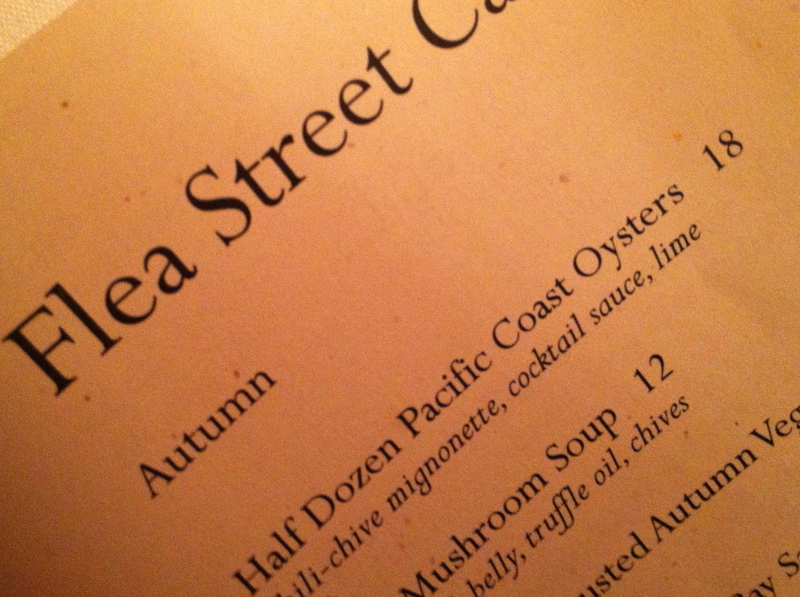 The Flea Street Café menu features fresh organic local and seasonal foods. 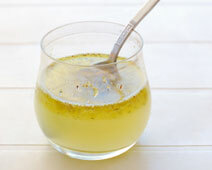 Menu items range from superb salads to elegant entrees. 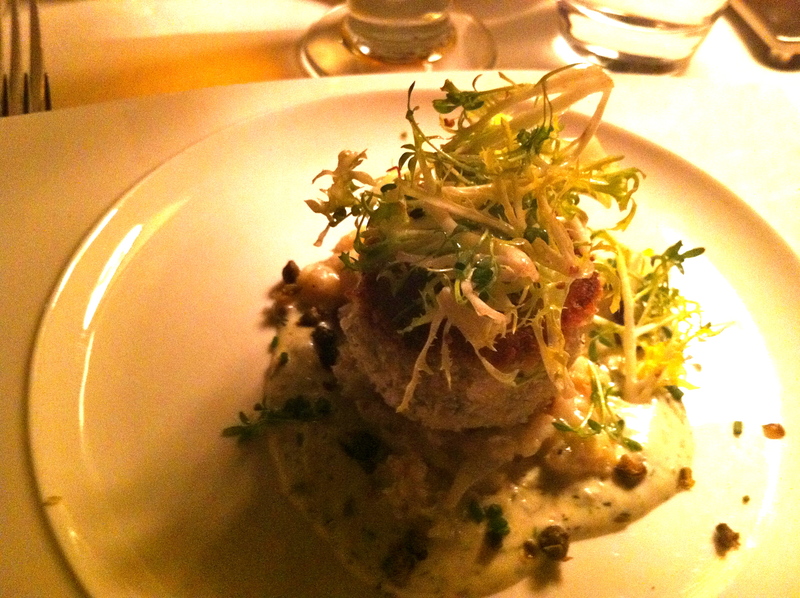 The crab cakes – beautiful presentation and delicious, by all accounts. Jesse truly believes that sustainable cuisine links together people, ingredients, respect for the environment and culinary traditions. Our group certainly enjoyed her demonstration of living these principles on a daily basis.